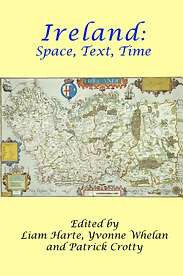 The central concern of Ireland: Space, Text, Time is to explore the diverse ways in which discourses of time, space and textuality have shaped historical and contemporary understandings of the relationship between place and identity in Irish culture, both at home and abroad. Taking its cue from the prevalence of metaphors of space and time in literary, academic and popular discourses of identity, the book investigates the material embodiments of these constructs in a range of cultural practices and phenomena, from novels and films to buildings and monuments. The shaping influence of certain key historical figures is also considered, and due emphasis is given to the dialogical relationship between cultural developments in Ireland and those in the wider Irish diaspora. The volume as a whole is underpinned by a commitment to the use of interdisciplinary perspectives and approaches in the study of Irish culture and society. As the debate about the benefits of interdisciplinarity within the plural field of Irish Studies continues to simmer, Ireland: Space, Text, Time aims to demonstrate the practical ways in which scholars from different disciplines can fruitfully contribute to a multivalent discussion of the significance of particular forces and themes in Irish culture.